Set aside the flour to cool. Using an electric mixer, cream together the sugar and butter until fluffy and well combined. Beat in the flour 1/4 cup at a time just until all combined. Divide the dough into 3 portions and add food coloring gel into each bowl. Pink in one bowl, purple in the second bowl. and green in the third bowl and mix until well combined. 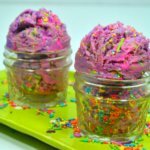 Place the dough back into the original mixing bowl and add in the unicorn sprinkles. Mix just slightly together but not too much so that the colors don’t fully combine!